Last year, global trade accounted for 60% of world Gross Domestic Product. However, in addition to contributing to GDP, the global trade regime is also responsible for a wide array of environmental impacts–including natural resource damages, pollution and climate change. 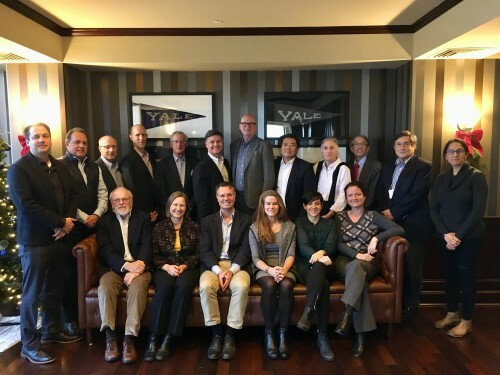 On November 30 and December 1, 2017, the Yale Center for Environmental Law & Policy gathered twenty top scholars and practitioners for a two-day workshop exploring the intersection of trade and climate change. This workshop served as a key tenant of the Center’s ongoing “Exploring Trade and the Environment” project, a long-term venture aimed at furthering the conversation on how the trade regime can better accommodate efforts to combat climate change. Workshop participants included Sue Biniaz the former Deputy Legal Adviser at the U.S. State Department, as well as the lead climate lawyer and climate negotiator for the U.S.; Ricardo Meléndez-Ortiz the CEO of the International Centre for Trade and Sustainable Development; Doug Kysar a Professor of Law at Yale Law School and leading expert on torts, environmental law, climate change, products liability, and risk regulation; and Aik Hoe Lim the Director of Trade and Environment Division at the World Trade Organization, among others. A prominent theme of the workshop centered on how the global trade regime intersects with the 2015 Paris Climate Change Agreement. Countries have committed to a range of strategies to achieve their Nationally Determined Contributions (NDCs) of the Paris Agreement, from increasing their use of renewable energy, to improving industrial processes, to policies such as a carbon tax. The panel discussion at the workshop explored how various approaches to climate mitigation could impact the current global trade paradigm. The workshop continued with a session titled “Does Climate Change Demand a Normative Shift in How We Think About the Trade Regime?” that examined how international trade might counteract national emission reduction targets. Participants discussed opportunities to reduce black carbon, commonly known as “soot,” which is a particularly potent greenhouse gas, produced as a byproduct of shipping. A later session focused instead on how the global trade regime could accelerate climate action. Participants discussed policies including subsidization of green goods and technologies, border tax adjustments related to carbon, as well as restrictions on the export of fossil fuels. In the final session of the workshop, participants were given the chance to reflect on their discussions while considering solutions for the path forward in addressing the trade/climate dilemma. James Cameron, an Executive Fellow at the Yale Center for Environmental Law & Policy, provided introductory remarks and participants broadly discussed academic, diplomatic, trade, and business solutions to climate change. Overall, there was consensus that although the trade regime isn’t a salient obstacle to climate change action per se, it is also not driving any action forward. Therefore, participants suggested that future work should focus on re-directing the trade regime to spur innovation and capital flow toward sustainability initiatives. To view a full list of workshop attendees click here. The Yale Workshop on Trade and Climate Change would like to thank the support of the the Edward J. and Dorothy Clarke Kempf Memorial Fund.